Here are the early results (and follow The Paddle League on Facebook and Instagram for more). Full recaps to follow after the weekend. 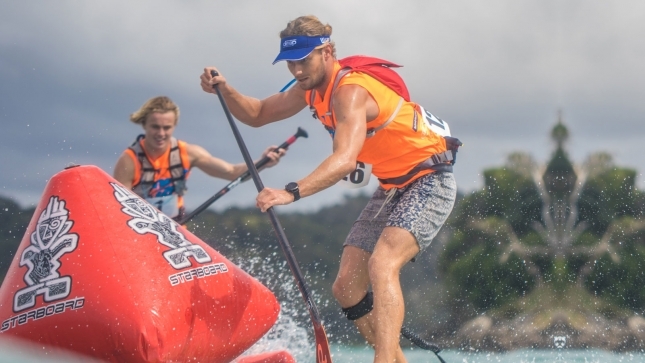 This year’s Hoe Toa Paddle Championships (the rebranded NZ National Titles) had a decidedly Trans-Tasman feel as Australia’s Lincoln Dews made it a clean sweep against his Kiwi rivals. Lincoln took out Saturday’s 16km ocean race (which included a solid 11-12km downwind leg) after battling all the way with Team NSP’s Marcus Hansen (who defends his national title). Trevor Tunnington and young gun Ollie Houghton rounded out the top four with solid efforts. The women’s race was dominated by Molokai champ Penelope Strickland. Tara Hope and Brianna Orams rounded out the podium. Defending champ Annabel Anderson didn’t race; the world number one is taking a hiatus from the sport to mend her body. Lincoln made it two from two in Sunday’s beach race, while Trevor stepped one spot higher on the podium after edging past Marcus. Ollie once again settled for the virtual copper medal (fourth place). Tara Hope produced something a bit of an upset in the women’s by defeating Penelope in the small waves at Orewa Beach, which gave NSP one gold, two silvers and a bronze for the weekend. New Zealand’s domestic race scene is famously dominated by the “blue boards” of Starboard and NSP, though it was good to see the green guys (ONE and DEEP) getting in the mix this year as well. 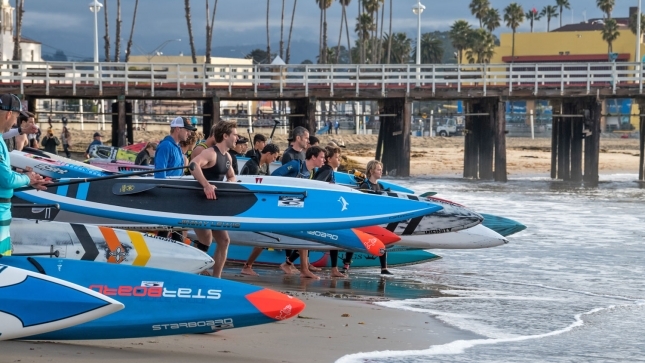 The big story to come out of the 32nd Annual Santa Cruz Paddlefest (yes, *32nd*) was the awesome performance of 15-year-old wunderkind Jade Howson. 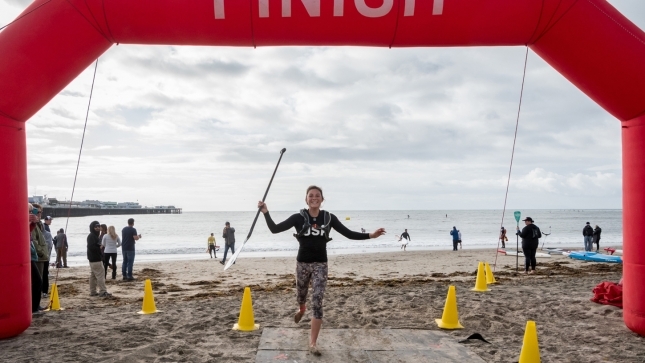 Jade comfortably won Saturday’s long course event despite a solid pre-season field that included April Zilg (an impressive runner-up), Candice Appleby, Shae Foudy and world number two Fiona Wylde. The young gun has shown prodigious talent over the past couple of seasons, but this is surely a breakout performance for Jade. It was a bit of a rollercoaster in the men’s race as an in-form Slater Trout took the win only to be DQ’d for not having the correct safety equipment. Mo Freitas was the beneficiary of the decision, with the Hawaiian moving to the first step on the podium after inching out Tyler Bashor in a photo finish. Team Rogue’s new signing had stitches in his foot this week and hobbled up the beach in pain, while 16-year-old and certain name-to-watch Tyler sprinted to the line and crossed almost dead even with the world number five. Others to impress included Itzel Delgado (4th) and Josh Riccio (5th) with the top five guys sticking together the entire race in the calm ocean conditions. Villefranche Paddle Race. The new one in the South of France. Rising star of the French scene Martin Vitry took out the distance race on Saturday ahead of fellow Euro stalwarts Federico Esposito and GlaGla champion Tom Auber. Dark horse Fanny Tessier took out the women’s event ahead of Frenchwoman Ines Blatge and Italy’s Chiara Nordio. The event continued on Sunday with the beach race, which produced some of the most epic conditions the placid Mediterranean has ever seen: solid 4-5ft waves were breaking on the outside of the course in a scene that wouldn’t have looked out of place in Hossegor or Salt Creek. We can’t wait to share more pics of the event with you.